Lots of things are described as “fit for a queen,” but if you want a car that was specially fitted for The Queen, as in Queen Elizabeth II of Great Britain, you’re going to have to pay up. The car was purchased from Jaguar by specialty memorabilia dealer Peter Radcliffe for 65,000 British pounds, or just under $100,000 US dollars. What makes the car so special, aside from the royal pedigree? Well, it’s a Jaguar Daimler V8. It has 14,000 miles on it; 2,000 of which were test miles and 12,000 of which were put on there by royal use. It’s in mint condition, is a lovely green color, and was retrofitted to meet all of Queen Elizabeth’s needs, including adding a special armrest with purse storage for Her Majesty and special security lighting in front and rear. The car’s interior is special soft leather, there are lambskin rugs for the flooring, and the trunk has a direct radio link to the Prime Minister (not functioning at this time). 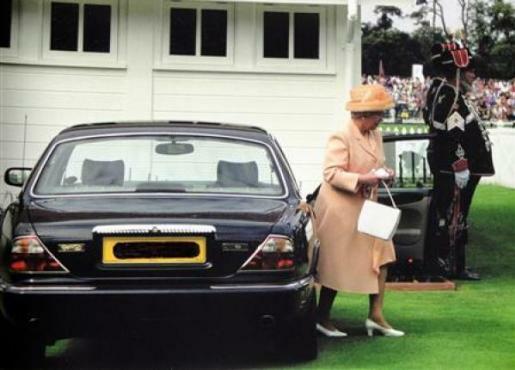 If you have a few thousand bucks to spare, you can bid on the car at The Queen’s Daimler.